Maerdy Newman sold for 40,000gn. Charolais bulls met a flying trade at the closing day of the Stirling Bull Sales. United Auctions sold 73 bulls to average £6,979, up £798 on the year, with 12 selling for five-figure sums. The breed society hailed a successful sale with commercial farmers willing to pay more for good bulls. Leading the charge at 40,000gn was June 2017 born Maerdy Newman from veteran Welsh breeder Esmor Evans. By the 10,000gn Blelack Fabulous, he sold in a two-way split to Cheshire breeder Charlie Boden for his Sportsmans herd, and Neil and Stuart Barclay for their Harestone herd at Banchory. Next best at 20,000gn was June 2017 born Allanfauld Neptune, by Balmyle Jasper, from Archie MacGregor, Allanfauld, Kilsyth, Glasgow. He sold to Richard McCulloch, Overhill House, Armadale. Thereafter the overall champion, January 2017 born Anside Nightrider, by Woodpark Elgin, sold for 18,000gn. Put forward by the Irvines at Braehead Farm, Drummuir, Keith, he stood reserve overall champion at Nairn Show in July. He sold to the Brampton herd in Ripon, Yorkshire. Perthshire breeder Bill Bruce sold to a top of 15,000gn for an entry from his Balymyle herd. Brought out by stockman Dane Ivison, Balmyle Nucleus – by the borrowed bull Maerdy Gouverneur – sold to the Smiths at Netherton of Invereddie, Peterhead. Balmyle also made 14,000gn selling Balmyle Navarone, by the same sire, to the Jeffrey family’s Kersknowe herd at Kelso. Next best at 13,000gn was reserve junior champion Burradon Noah, by Blelack Imperialist, from Morpeth breeder Chris Curry. He sold to J Warnock, Dreva Farm, Broughton, Lanarkshire. 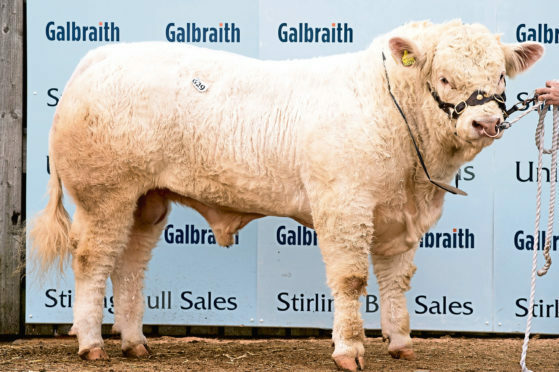 Other leading prices included 10,500gn for Firhills Nimrod, by Maerdy Grenadier, from father and daughter Jim and Alison Muirhead of Firhills Farm, Arbroath. He sold to GLB Foulger & Son, Flitchwood Farm, West Sussex. At 10,000gn was Elgin Neuer, by Woodpark Elgin, from the Milne family at Kennieshillock, Lhanbryde, Elgin. He sold to WJ Jack & Sons, Woodend, Killearnan. Also at this price was Balmyle Napier, by Maerdy Erget, from Bill Bruce, selling to the Hepburns in Hawick. Another at 10,000gn, selling to WR&A Mill, Forsie Farm, Thurso, Caithness, was Goldies Notable, by Gretnahouse Heman, from Dumfries breeder Hamish Goldie. Other leading prices included 8,500gn for Forglen Nero, by Thrunton Fairfax, from the Mutch family Forglen, Banff. He sold to J Hyslop & Sons, Netherton Farms, Abington. Also at 8,500gn, selling to John Gordon at Wellheads, Huntly, was Glenericht Machine, by Maerdy Hwre, from WK&P Drysdale, Middle Drimmie, Blairgowrie. Esmor Evans also achieved 8,500gn twice. First at this price, selling to W Duncan & Co, East Lediken, Insch, was Maerdy Ned, by Blelack Fabulous. The other, selling to J Leslie, Odinstone, Shapinsay, Orkney, was Maerdy Newel, by the same sire. Another at 8,500gn, selling to JM Forbes & Sons, Lochdhu Farms, Nairn, was Sportsman Nero, by Goldies Jerry, from Charlie Boden. Lastly, the reserve overall champion sold for 12,000gn after the sale, despite a 14,000gn bid being rejected in the sale ring. This was Coolnaslee Nolan, by Balthayock Justice, from the Crawfords in Northern Ireland. He sold to the Stouts at Whitehall, Stronsay, Orkney.